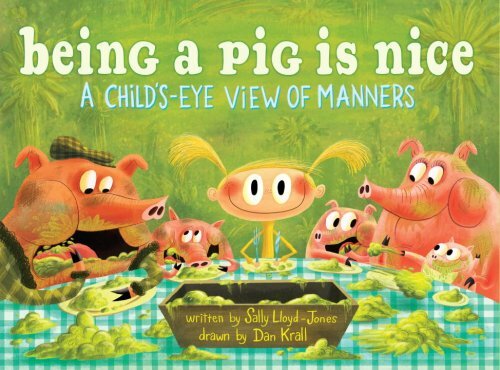 A hilarious picture book about manners, turned upside down! Why do animals get to misbehave, while humans have to act so prim and proper all the time? From the New York Times bestselling author comes a book about manners, all from the point-of-view of a little girl. In her refreshingly subversive world, monkeys must always use their fingers when they eat or get in trouble, elephants are encouraged to squirt and splatter everywhere, and pig parents ask their children to get muddy before they go to bed. Of course, if you're a pig, you smell, and that’s not nice. Still, the girl can see that behaving like an animal could be fun. . . .
Sally Lloyd-Jones worked in children’s publishing for several years, leaving in 2000 to write full-time. She lives in New York City. Dan Krall spends a great deal of time at Cartoon Network, where he has worked on many shows. This is his first picture book. He currently lives in Los Angeles with his wife, Rachel, and their cat, Fuzzums.